We had a wonderful meeting at the first Empathy Healthcare Café on June 25th, 2009. We received so many comments like, "great Café", "what's next?" and "how can we keep this going?" Thank you to everyone that contributed time, energy, ideas, stories, video, supplies, resources, etc. to hosting the Café. Below is the video of the Café. (4 of 13 Empathy Definition? (6 of 13) Why Empathy Healthcare? (7 of 13) What To Do? (8 of 13) What To Do? The Empathy Health care Cafe event was the best I have attended. It was anchored by Joan, a registered nurse, and more than one other medical literates were in the "house". Though I am not a trained nurse, it was my life exposure to medicine by my mother (a retired registered nurse/nurse practitioner), my deceased father (medical statistician at New York University Medical Center) and my mother's father (medical doctor trained in London, who devoted all his life to caring for the sick and poor in Honduras where I was born and raised). It is my hope next time you add more time to the event, as we were very much engaged. And hopefully, more people will attend. Thank you both for a very informed meeting. Edwin, you did it again and on target. President Obama should know you were on board from the beginning. Congratulations! Here are some beginning steps on what's next? 1. Join the Empathy Café discussion list. We can keep the conversation and energy going here. 3. Let me know if you would like to help plan and host more Empathy Cafés. I'll send another email with some ideas and times for this. 4. There were around 5 hours of video of the event. I'll be editing it together over the next couple of weeks. Robert took some video on his flip camera. You can already see his unedited video here of the Cafe. 6. Send me an email with any ideas and comments. 7. See below for the latest comments I found of Barack Obama talking about the importance of empathy. From the grass roots, let's support Obama and his call for more empathy in our society. How can We Change Healthcare to Address What Obama calls the Empathy Deficit? June will be a big month for Healthcare since the Obama administration and OFA are launching events and house parties in preparation for the big Healthcare discussions in Congress. 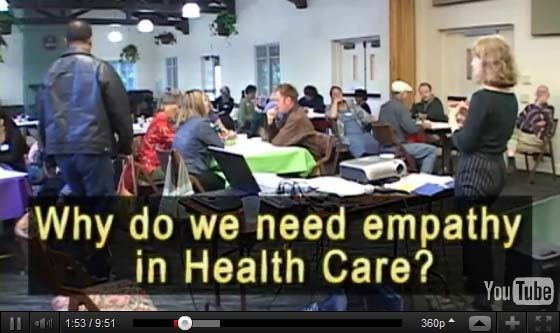 The Empathy Group will hold an Empathy Healthcare Cafe. Come join the planning meetings to create this event. In the Empathy Healthcare Cafe we will share and video tape personal stories about the relationship between an empathetic society and healthcare. We hope you will take part and share your stories and insights and then help find concrete ways to fill the empathy deficit. Please pass it on. Compiled from about 38 of his speeches and interviews, etc. on the topic of empathy. Join the Empathy Cafe discussion list.